The ancient Amitabha temple is located at the former “Yangfang” town within Wali village, now the second Olympic Media village which is east to the very north of Olympic Forest Park. 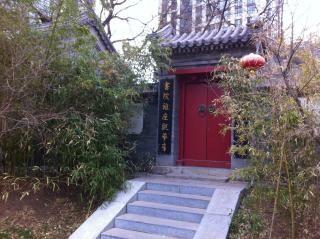 It was first built in Ming (1368-1644) Dynasty, and rebuilt during Emperor Kangxi period (1654A.D.－1722A.D.) of Qing Dynasty. Later, it was gradually damaged by wars; fortunately a donation for repairing the temple was made by many local residents in the Republic of China period (1912-1949). As time went by, the temple served as a school and a printing factory, where its initial function as a temple faded away. It was listed on the culture protection project by the Chaoyang cultural committee in 2003, and experienced its revitalization between June, 2007 to April, 2008, where the restoration was completed before the Game. According to a member in Chaoyang cultural committee, it is the only Amitabha temple left among the 11Amitabha temples built in the Republic of China period (Cao “Handnote 21”). The temple is now closed to the public, probably as the surrounding media village has been transformed to a residential neighborhood.